Patience is the name of the game. Not literally of course, the game is called Rage in Peace. But a lot of patience is what you’ll need to get through the difficulty that is this title, or you’ll end up raging for real. What do you expect from a game that comes with a death counter? The story of Rage in Peace revolves around Timmy, just your average person, working an average office job. Until one day, in the elevator on his way to work, he gets a little visit from death itself. The grim reaper informs Timmy he is about to die that day, by a beheading no less. 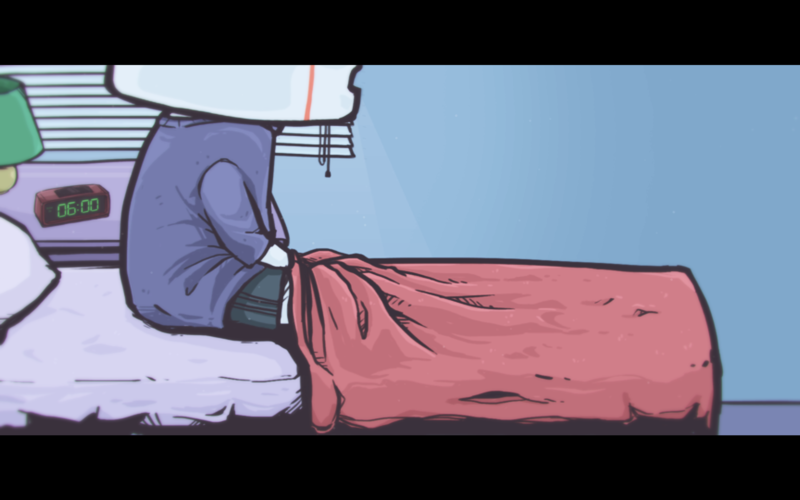 Timmy doesn’t seem too upset about his impending doom, but only expresses his dismay at not being able to complete his wish: To die in bed, surrounded by warmth and comfort. Death encourages Timmy to chase his dream anyway, because the day is still young and never was it stated when he would die exactly. However, fate won’t let Timmy go without a struggle, and tries to kill him on the way home, in different increasingly ridiculous ways. 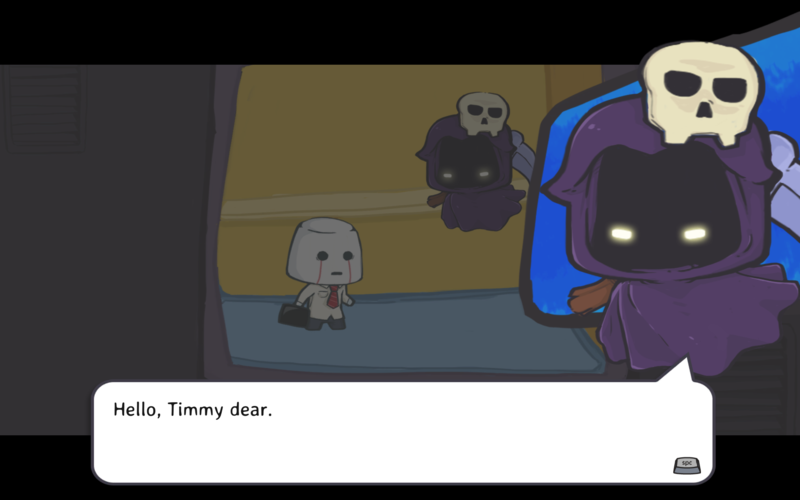 The actual gameplay is also interspersed with some vague cutscenes giving us a glimpse into Timmy’s dark past, which might be hiding a secret. Rage in Peace is presented in smooth looking 2D animation. In a side-scrolling fashion one has to make their way through the various levels, each with their own unique look and obstacles. 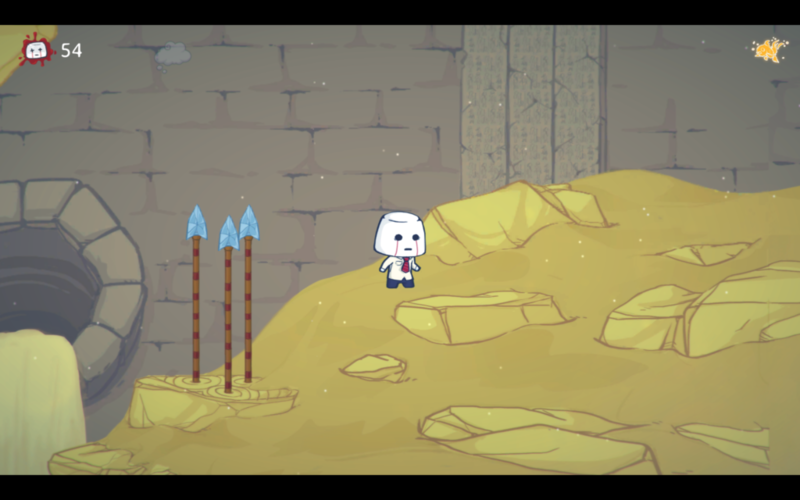 The character designs especially are rather charming and reminiscent of those in games like Battleblock Theatre, with a more cute and chibi-esque approach. The backgrounds aren’t always static either, giving the game a nice sense of depth to it. Rage in Peace comes with a stunning soundtrack, full of exciting instrumental music and fun sound effects. Especially the music for boss fights and the in-between level cutscenes is really great. Not to mention every death is accompanied by a satisfying splatter, that you will quickly grow accustomed to. Each world has its own melody, which is a nice touch though it doesn’t keep the soundtrack from becoming a tad monotonous, when you get stuck on one level for an extended period of time. 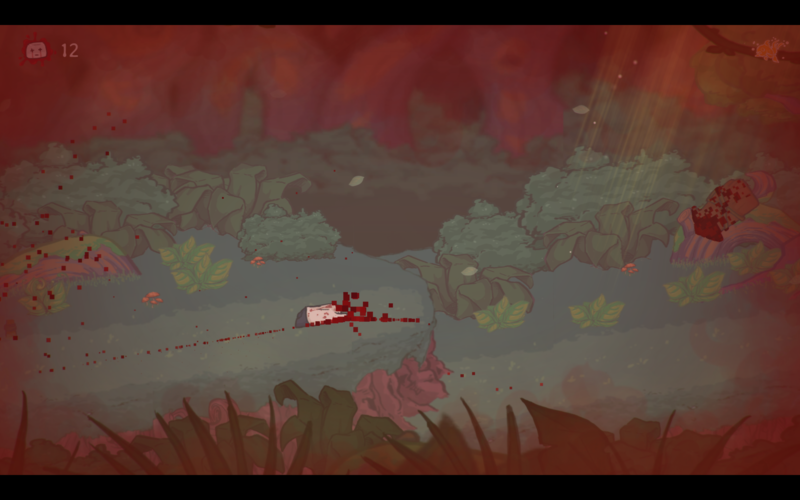 Rage in Peace is an action-adventure game. As a side-scroller, most of the gameplay consists of simply running with the arrow keys and pressing space to jump over the various deadly obstacles the game throws your way. For this purpose you also have a double jump. Most of the game can be surmised as trial and error, as well as having an element of memorization. You’re going to die, that’s a simple fact. But by trying the same bit over and over again, you slowly learn where the traps are and how to evade them. But even then, timing is key and surviving isn’t exactly a walk in the park. Luckily there are a decent amount of checkpoints to help you along. Every world consists of a few normal levels, with a few special areas littered among them. These special levels can be anything from falling down a hole or being chased by a boulder, to straight up boss fights. These boss fights in particular can be a challenge though, as they are pretty unforgiving. Luckily there is a special game mode, called Goldfish mode, for those who still want to enjoy the story but find the game a bit too hard to get through. This mode adds a lot more checkpoints, making for an easier gaming experience. Getting certain achievements will be impossible when playing in this mode though. 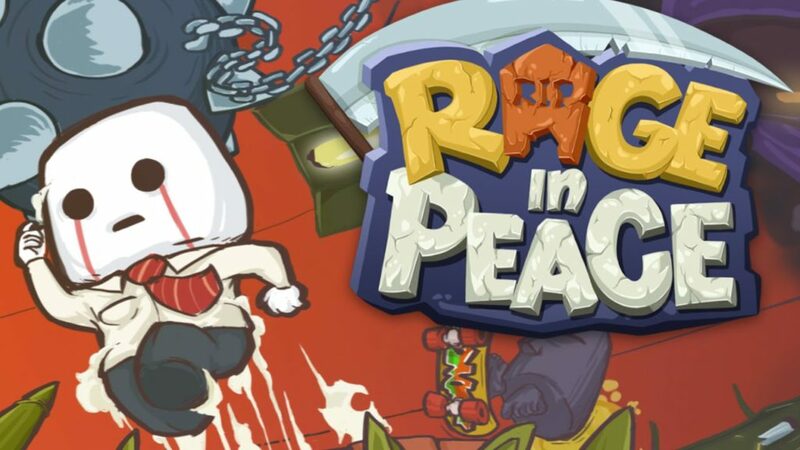 Rage in Peace is the kind of game that takes a lot of patience. Even after figuring out a level it can take a while to get through. You will often find yourself stuck on the same part over and over, but somehow it never becomes a chore, due to fun game mechanics and the sense of accomplishment when you finally do get through a challenging bit, encouraging the player to keep going. As you play you can also collect what are known as mementos, which give little snippets of background information on the world and the characters that live in it. These are presented as little floaty objects for you to grab. Beware though, because if you die immediately after getting them you won’t get the memento at all. Collecting all of these tidbits is a fun extra challenge to busy yourself with after completing the main game. Rage in Peace is Toge Production’s first endeavor into anything like this, and it’s an immediate success. Great music and fun gameplay make this game addictive as all hell, and even if its repetitiveness gets on your nerves, you will find yourself unable to stop as the next checkpoint is just out of your reach.